CAMDEN, Maine, May 2, 2017 – Camden National Bank announces $10,000 donation to LifeFlight of Maine’s annual summer fundraiser, Islesboro Crossing for LifeFlight. The open water swim across Penobscot Bay raises funds to support LifeFlight’s vision of providing critical care and medical transport to every person and every community across the state of Maine. LifeFlight operates three helicopters and an airplane that cover the entire state of Maine, bringing specialized equipment and critical care nurses and paramedics to emergency scenes and small, rural hospitals from Fort Kent to Kittery. Based in Bangor at Eastern Maine Medical Center/Bangor International Airport, Lewiston at Central Maine Medical Center and Sanford at the Sanford Seacoast Regional Airport, LifeFlight’s aircraft and crew have cared for more than 22,000 patients since operations began in 1998, providing access to the lifesaving care they need, when they need it. Now in its fifth year, Islesboro Crossing for LifeFlight is a 5K open water swim across Penobscot Bay from the Point Lookout Resort on the mainland to the island community of Islesboro. The event will take place on Saturday, August 19, 2017, and is expected to attract more than 400 swimmers, paddlers and volunteers from across the country and our local communities. The weekend long celebration includes a dinner reception, flyover from a LifeFlight helicopter and a hero’s welcome for spectators and participants on Islesboro. LifeFlight of Maine is an independent 501(c)(3) non-profit air medical and critical care transport organization. LifeFlight brings lifesaving critical care staff and equipment directly to the patient by helicopter, airplane and ground ambulance. It also provides advanced emergency medical training to Maine’s hospitals, emergency medical services (EMS) and public safety agencies. Overseen by 25 physicians, LifeFlight cared for nearly 1,800 critically ill and injured patients last year. Since its inception in 1998, LifeFlight has transported more than 22,000 patients from every hospital and nearly all of Maine’s communities and islands. 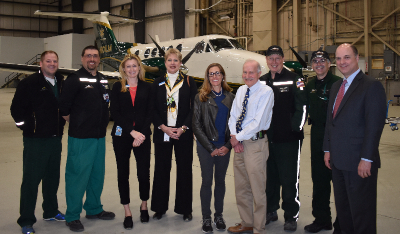 Photo caption: LifeFlight crew members gave Camden National Bank employees a tour of the LifeFlight hangar at Bangor International Airport in April. From L to R: Chuck Hogan, Flight Nurse, Bangor Base Manager, LifeFlight; Brent Watson, Flight Nurse, LifeFlight; Jody Landrith, Banking Center Manager, Camden National Bank; Vera Roberts, Commercial Regional Manager, Camden National Bank; Amy Root, Director of Development, LifeFlight Foundation; Norm Dinerman, MD, Medical Director, LifeFlight; Hargrave Garrison, Fixed Wing Pilot, LifeFlight; Jim Gerry, Fixed Wing Pilot, LifeFlight; Greg Dufour, President & CEO, Camden National Bank.